Jules Straus was born in Alsace, France, in 1844. His brother-in-law was Leopold Lazarus, another St. Helena pioneer. At age fifteen, Jules Straus came to America, sailing from Havre de Grace to New Orleans, arriving in 1858. There, Straus secured a position as clerk in a mercantile firm. He held the position some six years before sailing to California via the Cape Horn route, which took approximately six months. 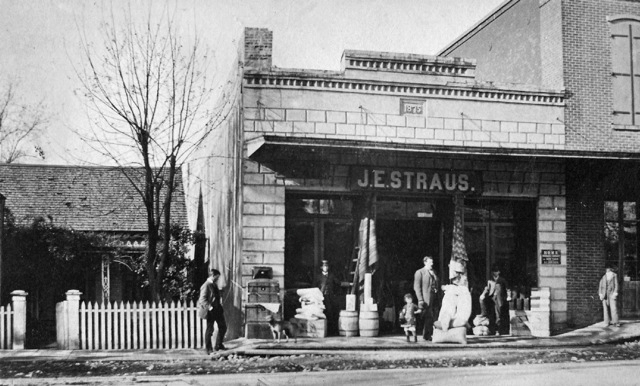 Jules Straus then settled in St. Helena, California. He accepted a clerkship in a general store from the firm of Lazarus & Levy, which he held for one year. 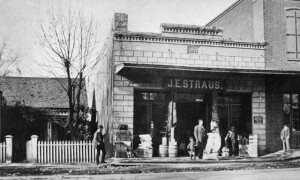 After moving around the Western United States, Straus once returned to St. Helena in 1870, this time starting his own business in the building now occupied by Wells, Fargo & Co., where he continued until 1875. Jules Straus was married in 1868 to Jeanette Levy, a native of France. Together, they had one child, Bernice B., born in St. Helena. They also adopted an older daughter, Mathilda R. Straus. Lin Weber, Under the Vine and the Fig Tree: The Jews of Napa Valley (Jewish Historical Society of Napa Valley, 2003). Henry Michalski and Donna Mendelsohn, Napa Valley’s Jewish Heritage (Charleston, SC: Arcadia, 2012). Lauren Chevlen is curator of this Eugene Straus exhibit.